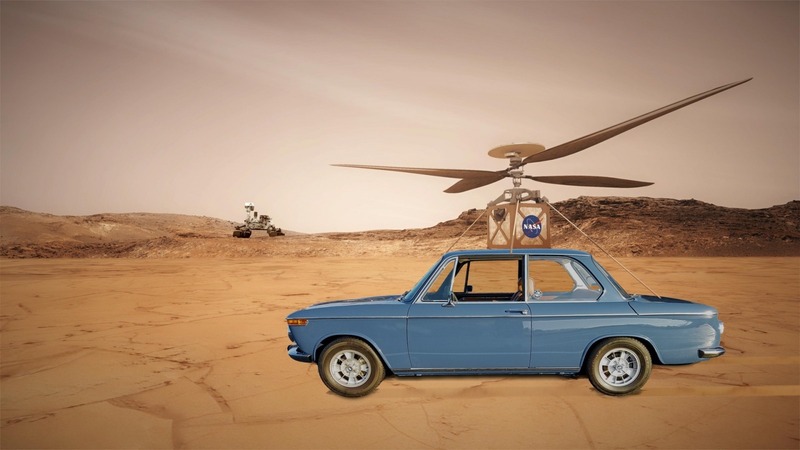 This image shows the Mars Helicopter prototype, a small, autonomous rotorcraft, atop a nicely-restored Riviera Blue ’69 2002. Besides all the fun enjoyed on the Mars expedition, several of the 02ers also provide essential testing and logistics services for NASA while they’re here - in this case helping evaluate rapid deployment options using this full scale rotorcraft prototype. The Mars Helicopter will travel with NASA's Mars 2020 rover mission, currently scheduled to launch in July 2020, to demonstrate the viability and potential of heavier-than-air vehicles on the Red Planet. The prototype will be aloft providing some great aerial shots for this years Le Mars race coverage. NASA's Jet Propulsion Laboratory will build and manage operations of the Mars 2020 rover for the NASA Science Mission Directorate at the agency’s headquarters in Washington, not far from Alexandria, VA, the 2002’s hometown.